When your skin is affected by uneven facial pigmentation from brown spots, small round marks from sun exposure, freckles, hormones, and birthmarks this can leave your skin without an even and luminous complexion. Laser therapy is an excellent and quick solution to this. Melanin gives our skin its color. The amount of melanin equals the lightness or darkness of our skin. Pigmented lesions are dark because the melanin is concentrated in one area of the skin due to overexposure by the sun's damaging ultraviolet rays. A Q-Switched Nd:YAG Laser creates a special wavelength of light that is absorbed by the pigmented lesions. The light vibrates and shatters the pigment breaking the melanin into micro-particles thus lightening up the lesion. The spot turns gray or white for a few minutes which is a natural response of the skin as it absorbs the energy. The spot will darken and slough off completely within one or two weeks. What type of pigmented lesions can a laser remove? Ota. Your technician will identify your specific type of lesion and discuss the best treatment. Unfortunately Port of Wine Stains can not be removed and you will need to talk to your Dermatologist for the best treatments for this type of birthmark. Do Lasers remove my normal skin pigmentation? Yes it can. However, the laser is specifically designed to target the dark concentrations of melanin. After the removal of the darker melanin, some whitening could occur. Your body's natural regenerative ability will replace the normal melanin over time, returning the skin to its natural color. How many treatments sessions will it take to remove the pigments lesions? Most pigmented lesions are removed within one to three treatments. The energy of the Q-Switched Nd:YAG laser emits light in a very fast short pulse. The impact of the energy form the pulse of light is similar to the snap of a very this rubber band. No anesthesia is needed. After treatment, the area will feel similar to a mild sunburn. Redness will disappear within a day and the skin will return to its natural color. Pigmented lesions do not return, Some birthmarks may return after a period of several months to a year. However the procedure can be repeated. It is important to wear an SPF 30 or higher to help these lesions from returning. What type of post- treatment care is necessary? Usually ointment will be applied to the area immediately after treatment. Keep the area clean. Continue applying an ointment like Aquaphor as instructed by your technician. Sun screen should be applied daily. 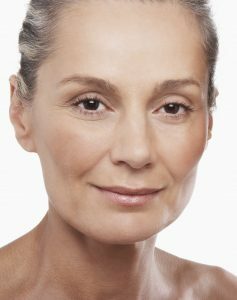 Lasers can be used to treat deeper pigment problems, including Melasma (often called 'Mask of Pregnancy'). 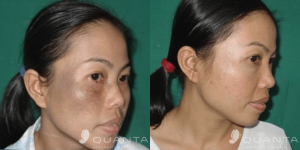 Melasma appears as a dark stain on the skin and can be triggered by hormonal changes. Although doctors have yet to find a cure, a combination of laser therapy and skincare can manage the condition very well. Talk to your technician about your skincare concerns and see if laser therapy is the right choice for you. ReGen Laser offers many solutions to your skin care concerns.